The drop-top Dawn has been aerodynamically optimized with a clever new roof. Effectively a tonneau cover, the hand-made cowl is formed from carbon-fiber and aluminum and was precisely sculpted to funnel the air gracefully away from the passengers in order to enhance comfort. Behind the front seats, the cowling offers a pair of lockable and leather-lined storage compartments for personal effects. 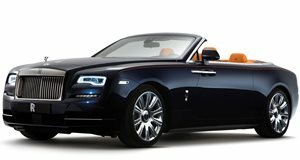 The deck of the cowl is swathed in Rolls-Royce's signature leather, which will match the interior of the car. The Dawn Aero Cowling show car for Geneva is finished in a Cassiopeia Silver exterior paint paired with 21-inch alloy wheels and a Casden Tan leather interior, complemented by Selby Grey piping, stitching, and black contrasting elements. Rolls-Royce didn't specify prices for the new Dawn Aero Cowling, but considering the materials used in its construction, used for the cover, don't expect this to be an inexpensive addition.